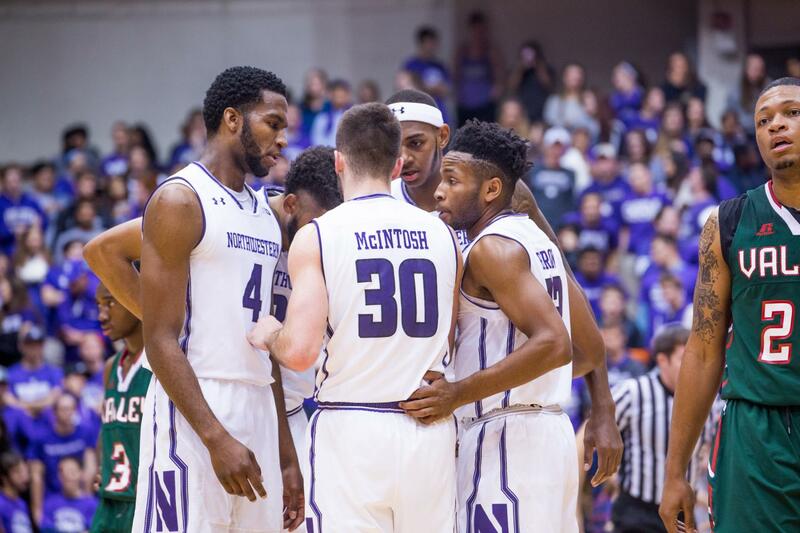 Northwestern players huddle during a non-conference game last year. The Cats' full non-conference schedule for this season was released Thursday. Northwestern will play three non-conference games against major conference teams away from home and host eight games at Allstate Arena in Rosemont before Big Ten play begins, the program announced Thursday, unveiling the Wildcats’ full non-conference slate. The most notable contest in Thursday’s announcement is a Dec. 22 game at Oklahoma. The Sooners struggled last season, finishing just 11-20, but made the Final Four in 2016. The game is the first in a home-and-home series, NU’s release said, meaning Oklahoma will come to Evanston for a future game, likely in 2018. Most of the other notable games on the Cats’ pre-Big Ten schedule were previously announced: a Nov. 15 home contest in the Gavitt Games against NCAA Tournament qualifier Creighton, a trip to the Hall of Fame Tip-Off Tournament in Connecticut for a pair of matchups and a game at Georgia Tech in the Big Ten/ACC Challenge. The Georgia Tech game will be Nov. 28. NU will play La Salle on Nov. 18 in the Tip-Off Tournament and face either Texas Tech or Boston College the following day. The Cats’ season begins Nov. 10 against Loyola Maryland, the first of three straight games at Allstate Arena — NU’s home this season as Welsh-Ryan Arena undergoes renovations — before the trip to Connecticut. The Cats will play consecutive non-conference home games on only one other occasion, against Chicago State and Valparaiso immediately after Finals Week. The Chicago State game on Dec. 11 will be NU’s first contest since the Georgia Tech game, a span of two weeks without a game. The Cougars will be one of two crosstown opponents for the Cats, who travel to DePaul on Dec. 16. Brown comes to Rosemont on Dec. 30, after which Big Ten play will begin. NU’s conference opponents are known, but the full schedule has not been released. The Big Ten Tournament is a week earlier than usual, which, coach Chris Collins told The Daily in July, made scheduling “more difficult than ever.” Though the Cats will play 13 non-conference games, just as they did each of the past two years, and have extended breaks for finals and Christmas, NU will play three games in less than a week on two separate occasions.